So there is a holiday that’s celebrated here in Michigan that I’d never heard of until a few weeks ago. One of the teaching pastors mentioned that his wife asks him each year what he’s going to get her for Sweetest Day and he tells her nothing because it’s not a real thing. The congregation laughed and I was left thinking, What is he talking about? Then I went to the store with Lindsay and we saw the above sign near the cards. I had to take a picture and then yes, I posted it on Facebook. The holiday began when a committee of candy makers gave away 20,000 boxes of sweets to those less fortunate in Cleveland. I think it’s a nice idea to give away chocolate to people who might not normally receive gifts, but people argue that the holiday was invented so candy maker s could increase their sales. 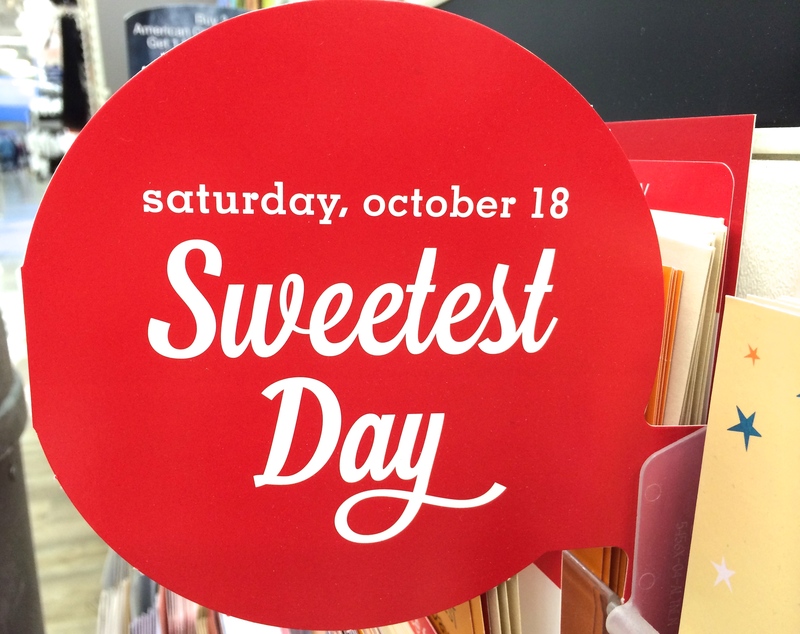 While I have yet to experience Sweetest Day, what I’ve seen so far resembles Valentine’s Day in October and I just hope I can use it as an excuse for my husband to take me to dinner. I’m not gonna lie, chocolate would be nice too. This topic came up during the sermon because it was focused on how to stay in love. The divorce rate is continuing to increase and sadly, I’ve had more students in my classes over the last nine years whose parents are separated or divorced than I’ve had whose parents are happily married. Why is that? One of the ideas that was talked about in church was that we give up too easily when we think about how unhappy we are and that there could be something “better” out there. The three keys to staying in love, according to the sermon, were to worship God, work on myself, and serve God by serving our spouse. It was a neat sermon beginning with a John Legend song, which I always think is funny to hear a”regular radio” song at church. If I’m honest though, I wasn’t really thinking about my husband, Mike. Sure I had Michael in mind when the sermon started. Hearing the lyrics, “Cause all of me loves all of you. Love your curves and all your edges all your perfect imperfections” made me miss him as he was on call yet again on Sunday. But the more I thought about Mike the more thankful I was for him and didn’t feel like we needed a whole lot of working on. Don’t get me wrong, our marriage isn’t perfect, but I’m so in love with my husband I know I could never be happier. He compliments me regularly no matter how many times I roll my eyes. He keeps our family’s best interest in mind when he’s making decisions. He is easy to get along with; like when I’m hungry and going crazy he listens patiently, feeds me, and then forgives me for all the things I didn’t really mean to say. Or when I screw up a recipe so badly we can’t actually eat it, he’ll run through a drive through. He holds me when I’m crying even if it means I’m getting snot all over his shirt. And he can still make me blush when he looks at me that certain way. We don’t always have a ton of time together, but when we do we try to make it count. When thinking about the relationship I needed to strengthen my mind drifted from Mike to God. I am constantly questioning my love and devotion to God. He isn’t always first in my mind like He should be. My motives aren’t always pure. I know that I’ve lost that passion of the newly born-again Christian and I want it back. On my first ever Sweetest Day I plan to spend the day with my family, go out to dinner, eat chocolate, put the kids in bed early so I can stay up too late with my hubby and during it all I want to fall back in love with God. set fire to my inner desires. Lord, rekindle that flame again. Lord I want to fall in love with You. made me hunger for Your word. Lord, I want my starvation renewed. pulled me into your presence. Lord, my devotion I long to impart.